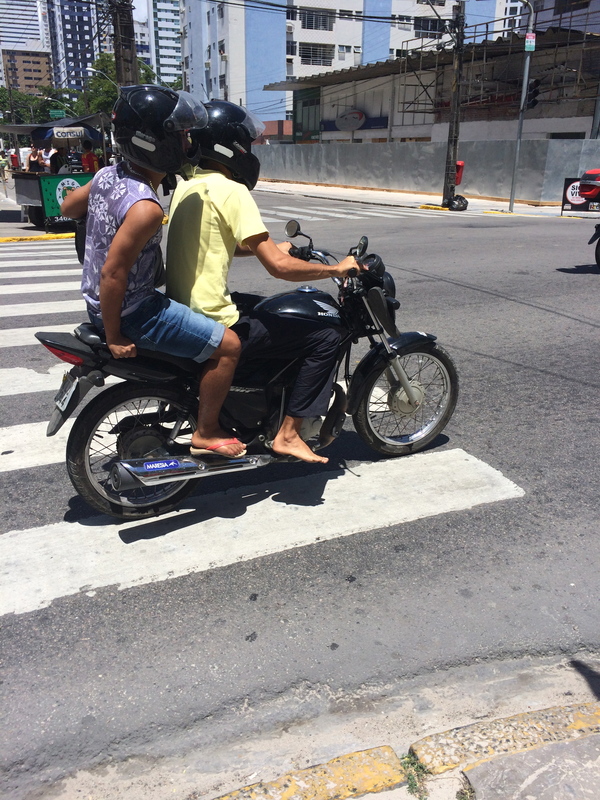 I had the pleasure to spend a week in the Brazilian city of Recife for work recently. The weather was warm and the streets full of bikes. 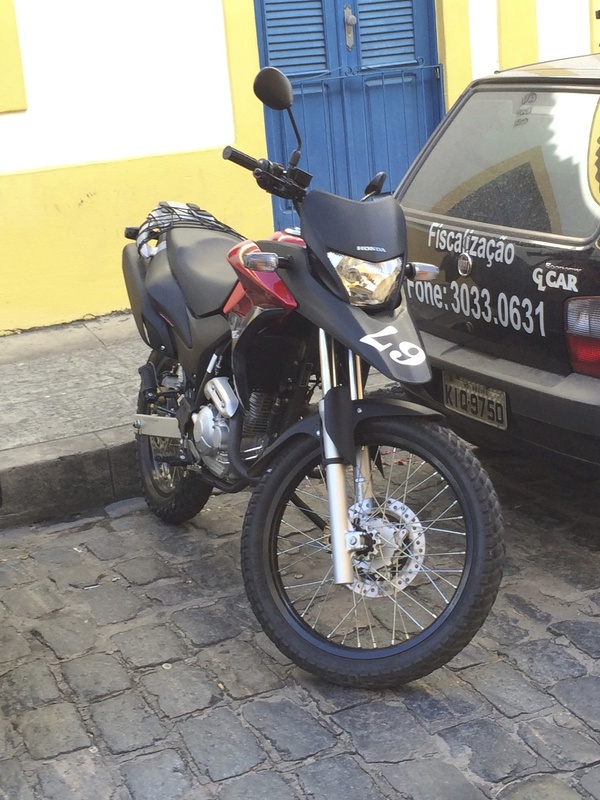 Every day during my taxi commute to the convention centre where I was working I observed the cool bikes we do not get on our roads, like the Honda XRE 300. I wondered if it would be a good light adventure bike. At a time when adventure motorcyclists are realising that bigger is not necessarily better, and CCM is trying to sell it’s (overpriced) 450 Adventure, maybe Honda would be wise to start importing the XRE 300 into the European market. With good suspension and a solid rack it would probably make a good, economic and reliable light touring bike. 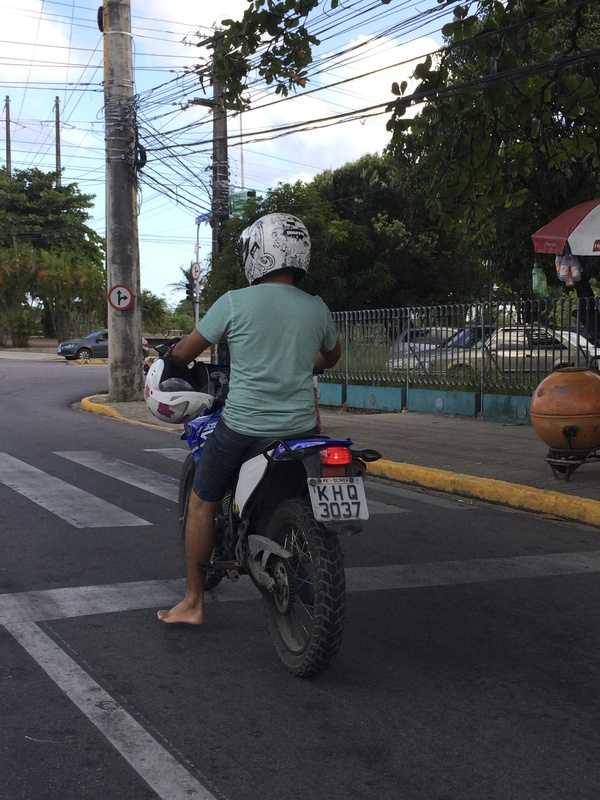 In their defence, they probably think that it is safer than to ride in flip-flops as many of them hang their sandals on their mirrors or foot-pegs while riding…safety first. 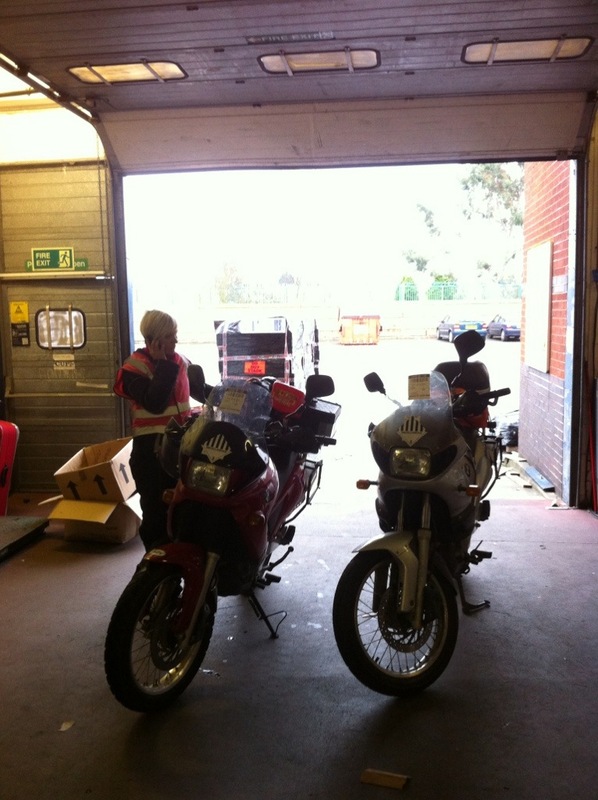 Just before Christmas Lloyd from Red Coat called me to say that our bikes were safe and sound in a hangar close to Gatwick. Unfortunately we couldn’t pick them up until the new year as we were abroad visiting family over the christmas break. We did make our way to the Red Coat hangar on a bleak January Monday morning and were welcomed by Lloyd’s helpful staff who showed us to our bikes and relieved us of the modest sum of £1400. If you consider that our 2 bikes were kept in a hangar for 6 weeks, made safe to fly, loaded on a plane, flown 6 hours, unloaded, parked at Gatwick, picked up and driven to Red Coat offices, I dare say it’s a cheap price! The first thing we did was to put the mirrors back on and rewire the batteries which had been neutralised for the transport. We then filled in our tanks with the two 5L jerrycans we had brought with us and tried to start the bikes. Louise’s started straight away, as if it hadn’t been sitting empty and neglected in Africa for 6 weeks. Mine, on the other hand, didn’t make a sound. I was expecting that the cheap Chinese battery I had bought in Tan Tan would not last long and it hadn’t. To be fair, it had performed flawlessly between Tan Tan and Banjul so I couldn’t complain. The 6 weeks wait did kill it though. Lloyd and his staff were very helpful in trying to jump start it and push starting but it was obvious that I needed a new battery. Luckily enough there was a motorcycle dealer a few hundred meters away so I jumped on the back of Louise’s bike and we purchased a brand new, quality, Yuasa battery. After all, my F650 deserved a treat. She obviously appreciated the gesture and fired up instantly. It was a great feeling to be back on the bikes, in our yellow and pink hi-viz. I was again surprised at how good these BMWs are. 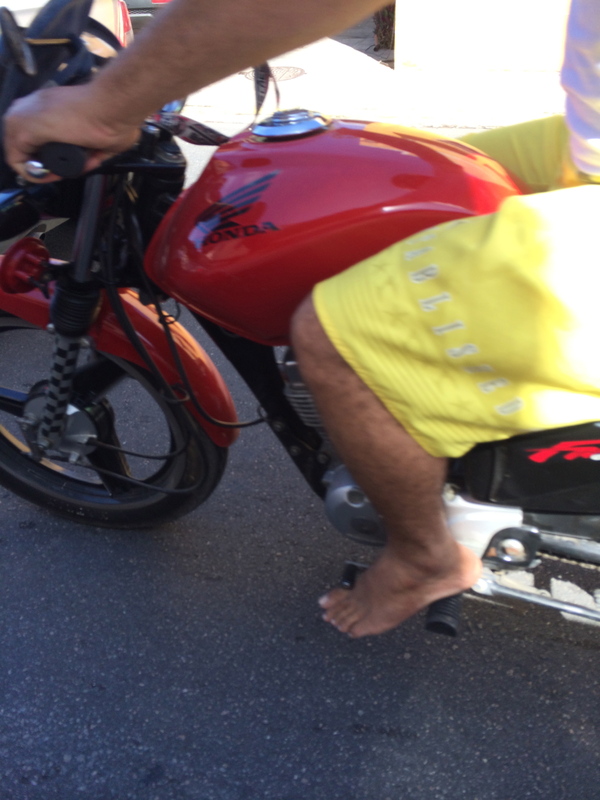 So easy to work on and the level of comfort they provide for a 650cc single is incredible. The ride home through London traffic was a piece of cake after having dealt with Dakar! It felt really bleak and grey though and I felt nostalgia for the craziness and the explosions of colours and smells we’d experience on our trip through northern Africa. This did reinforce my belief that motorcycle travel is singular in that it enables the rider to experience the outdoors while having fun and covering good distance. 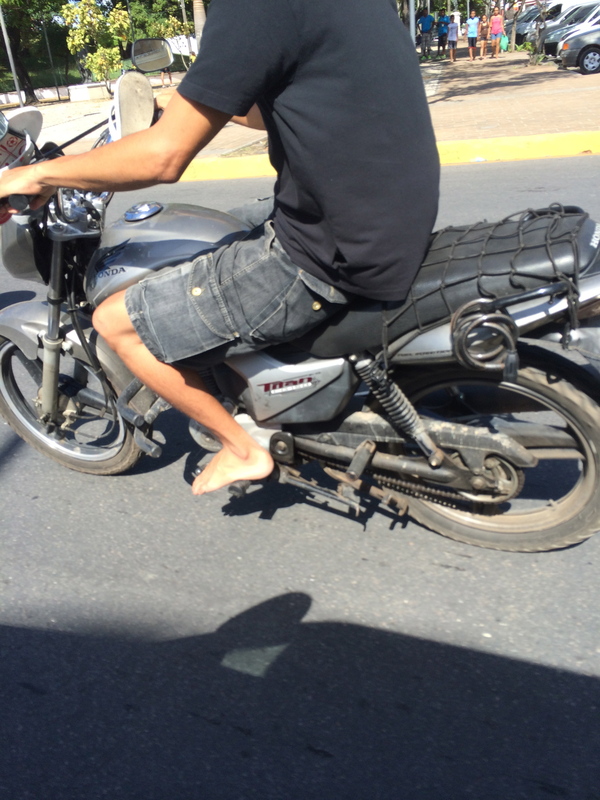 I was also reinforced in my conviction that motorcycle “adventure” is easy. The biggest hurdle is to take the decision to leave. The bike, if it’s in decent shape, will take you where you want to go. No need to worry about it too much; you’ll always find a way to reach your destination and will meet many kind and colourful people on the way. You will also learn a lot and build a wealth of personal experiences which you will never regret. 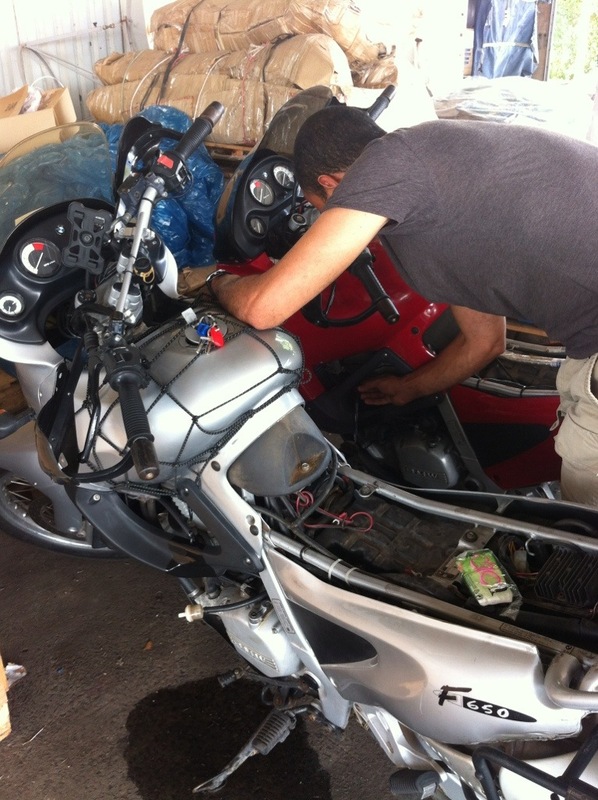 It was now time to say goodbye to our beloved motorcycles. They had carried us on an amazing 7000km journey from South London to Banjul in surprising comfort and relative reliability. Some friends have commented on “how unlucky you were with the breakdowns”. It seems to strike people but I need to set the record straight. We did have a total of 4 issues with the bikes, but 2 were actually only worn parts. I knew from the beginning that Louise’s back brake pads were thin but our mechanic told us they were fine… I also failed to properly look at our batteries, which would have revealed that mine was low on acid. So these issues could easily have been avoided. We did buy these bikes for a song and they’ve served us very well. We have developed a bond with our respective bikes and, eventhough they’re supposed to be identical, they have their own personalities and feel very different. Anyway, I digress. 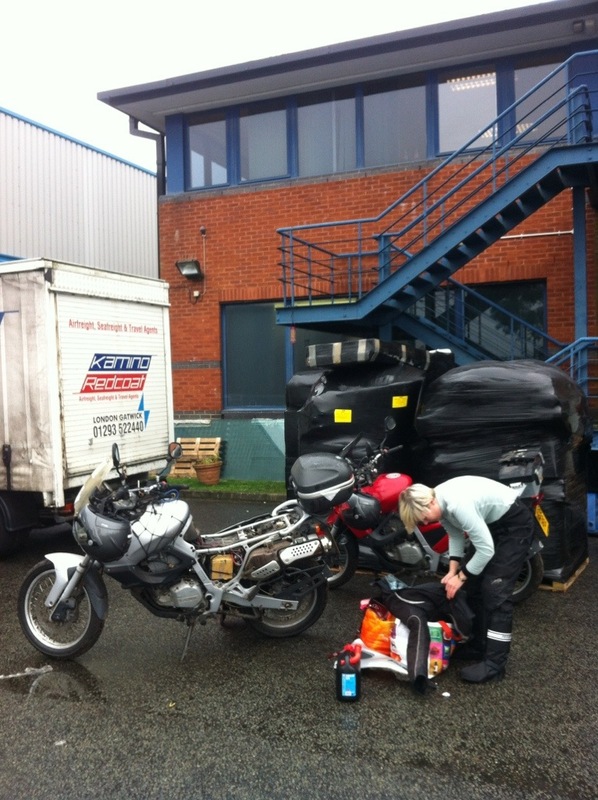 After 7000km we were at our destination and it was time to drop the bikes at our shipping agent, Redcoat. I had read about them online and the fact that they shipped bikes from Banjul is the reason we chose it as our destination. We had considered selling the bikes there but I didn’t want to spend our last days trying to find someone who would buy them and actually give us the money and complete all the paperwork before our planned return to the uk. And that’s not considering the import tax. 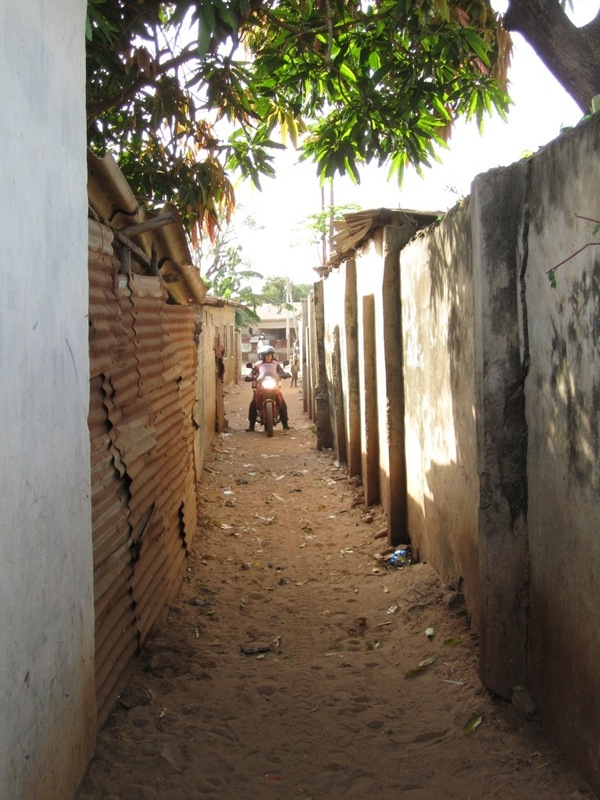 We left the hotel early in the morning so as to take in a longer ride and see the “suburbs” of Banjul. Our first stop was a French bakery where we had a breakfast of croissants and instant cappuccino. We then set out in what we thought was the direction of the airport but I spotted a car wash and we decided to give the bikes a well deserved pampering. The guys at the car wash did a great job cleaning them from 5 weeks of grime, Moroccan mud, Sahara sand and African red dust. We rode around in circles for about an hour looking for the airport. We had asked locals but their directions were a bit vague… We did enjoy being told “go straight after the lights and right at the first turn-table”…ha! It’s is where the musical spirit we couldn’t find was hiding! One helpful man got on his knees and drew an elaborate map in the sand. It didn’t help though because we rode past the airport twice without noticing it. Indeed, Banjul International Airport is a little difficult to find; there is no sign to it… and it’s the size of our block of flats. That being said its actually a pleasant building to look at, in a 1960s architectural style which dates back to the (few) days of plenty when the high price of peanuts on the world market filled the national bank with hard currency. We found our agent and were asked to come back in 2 hours when Mister George would be there. He needed to inspect the bikes. We went for a terrible lunch at the airport’s restaurant and looked at the presidential Tupolev which had seen better days. Upon return we met with Mister George who asked us to empty our tanks and took a look inside our top boxes for potential contraband. While we were doing this we were accosted by 4 policemen in combat uniform, carrying Kalashnikovs. They were actually accompanying a delivery of cash that was to be flown out of the country. We had a friendly chat with them and gave them our badges. They told us that they came regularly and that they would keep an eye on the bikes for us. Thanks guys! We then proceeded with the paperwork. Although this was done in a professional manner it did take a very long time. But the staff was courteous and we were offered seats so we can’t complain. A funny moment was when we rolled the bikes on the industrial scales to weigh them. Louise saw this as an opportunity to check if she’d lost weight during the trip and everyone around us became very interested too. She first stood on the huge scale while the technicians read out her weight aloud and then took her to a smaller scale which was more accurate. This provided entertainment for everyone who was standing in the area. I say this because, to our surprise, about a dozen men in business attire were spread out on floor mats, taking a nap! Once all the documents were signed (5 hours after we’d arrived) our bikes were in the competent hands of redcoat and we were bike less. For the first time in 5 weeks we had to get taxis to get us around. It was a strange feeling after all the independence we’d experienced. 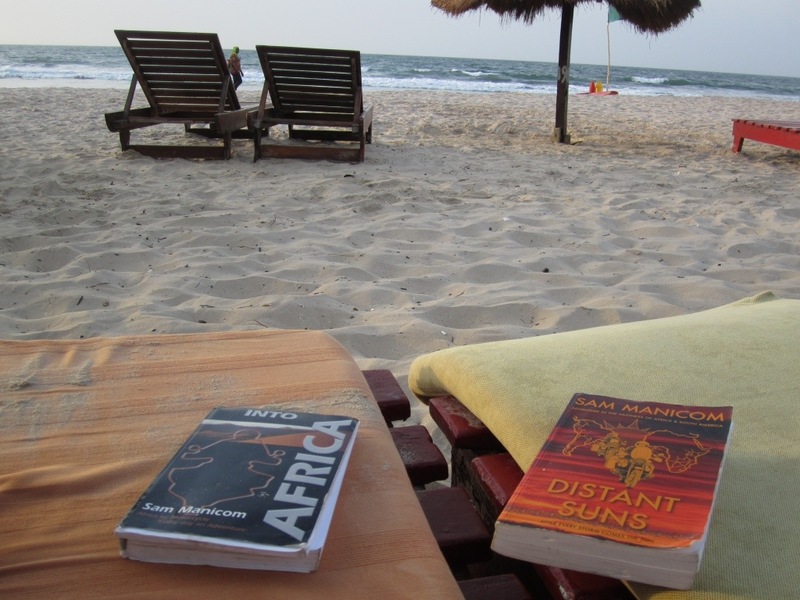 All we had left to do was sit on the beach and finish our books…. 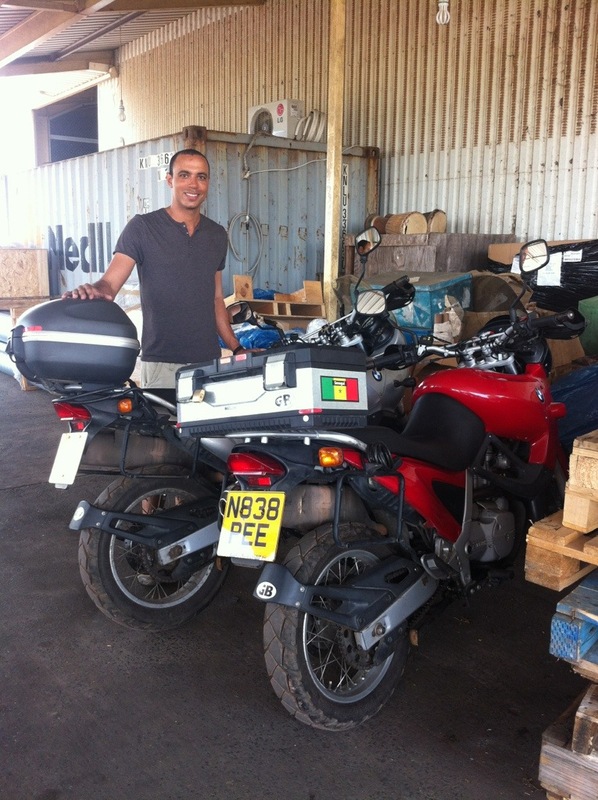 And we have left the bikes with Red Coat shipping agents at Banjul Airport. Sad moment but we look forward to seeing them at Gatwick in December.